AIR – the working force behind the blaster. A media blaster is a pneumatic (engineering for air) tool. Pneumatic means it needs air to work. There are lots of different types of pneumatic tools. You probably have a few laying around the shop. There are nailers, sanders, impact wrenches, drills, a blow gun, jackhammer, just to name a few. All of these tools use pressurized air to get work done. A media blaster is no different. The caveat comes in the amount of air it needs. The air flow (volume per time) is measured in Cubic Feet per Minute (CFM) or Liters per Minute (l/min) if your using SI units. 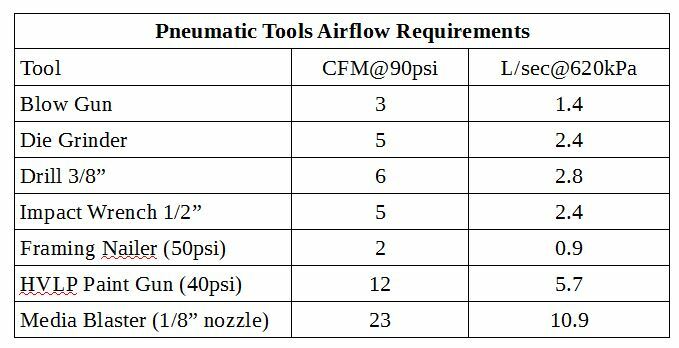 Check out the Airflow Table for a comparison of the CFM requirements for some common pneumatic tools. As you can see, media blasters can use a lot more air than your normal shop tools. Well, I’ve got a big ol’ 80-gallon compressor in the corner of my garage and it puts out 175 psi. It’ll run any tool out there! To that, I say, yes. But the thing is, there is more to compressors than just pressure, there is also air flow. Pressure (measured in Pounds per Square Inch (psi) or Pascals (Pa)) is the force that does the work. Airflow (CFM), how much air the compressor makes, determines how much work gets done. Air pressure (psi) is force over an area (hence pounds per square inch). Think about it this way, take one square inch (about the size of your thumbnail) and apply a force (push on your thumbnail), that’s pressure. The harder you push the higher the pressure. Air coming out of that big ol’ compressor is applying a force of 175 psi. That is enough force to hurt your thumb (and I would advise against trying it). Air pressure is the force that drives the pneumatic impact wrench to remove the lug nuts on a wheel. It’s also the force media blasters use to remove crud off that rusty car frame effectively. Airflow is the amount of air a compressor makes. Let’s think about a bicycle pump, you know, one of those compact types that fit on a mountain bike. It is the perfect tool for airing up a bike tire. Every time you push down on the handle, a small amount of air (volume) enters the tire increasing the pressure in the tire. The more you pump (per minute), the higher the pressure in the tire climbs (some bike tires require 135 psi). You can air up a bike tire with a small pump that produces a small volume (CFM) of air (even at a high pressure (psi)) because bike tires are relatively small tires. Now, let’s go air up a monster truck tire. The same bicycle pump can do the job because pressure is not a problem (monster truck tires only need 10 psi). Right? “Forget that! you know how long that’s going to take!” Yeah, about a billion strokes later you might air up one monster tire. A bike pump doesn’t make enough air (volume) to fill a monster truck tire efficiently. You would have to stroke the pump lots of times to make enough volume to air up the monster tire. The bike pump has a very small airflow (CFM). So if that big ol’ 80-gallon compressor has a 175 psi worth of pressure and only makes 12 CFM, then it will take twice as much time to remove crud off that rusty car frame than if it makes 25 CFM. Twice the air flow, twice the work. And that is the difference between pressure and air flow. One more word on pressure and air flow. If you look at the Airflow Table again you will notice most of those tools are rated at 90 psi (it’s sorta the standard at which air tools are rated). Pressure and airflow are not unrelated. Compressors output smaller volumes of air as the pressure increases. The data table of a typical home shop air compressor may list cfm@psi as 15.25 CFM@40 psi, 14 CFM@90 psi, and 13.25 CFM@175 psi. Focus on the 90 psi rating as it is the most common. Note: It is not uncommon for air compressor manufactures to overstate the true ratings of their units. It is always better to err on the side of caution and have more compressor than you need. So what’s the point of that big ol’ 80-gallon tank? To act as a reservoir when you’re using pneumatic tools. Most of the time you use these tools in a short burst, say to take a tire off a truck. The tank allows you to run tools that require more air (CFM) than the compressor can produce. At least until the tank runs out of air. In fact, many large volume air compressors don’t have tanks at all. They produce more air (CFM) than the tool requires so there is no need to store any for reserve. Can you tell me how many CFM my compressor has? The short answer is no. We don’t sell air compressors and we can’t keep track of a zillion different makes and models. However, you can generally contact the manufacture of your unit via phone or internet and they should be able to tell you. There is a very loose generalization we tell people. Most home/small shops have compressors are either 5hp producing about 15 CFM or 7hp producing about 25 CFM. So how many CFM does my compressor need to run a Texas Blaster?